If you are transporting antique furniture, oversized sculptures, musical instruments, or any other valuable pieces that are too bulky to fit in your car or too heavy to handle on your own, you need to hire professional shippers of fine art. An experienced art courier for large items is an ideal choice for this task, no matter whether you are moving outsized and heavy objects to your new home, business partner, client, gallery, or auction house. Moreover, do not think that this service is very expensive because Fine Art Shippers can do this job for you at a very reasonable price. Just request a free shipping quote or contact our team directly to discuss the nuances of the moving process, and we will offer the most efficient and cost-effective solution to any problem! When you deal with an expert art courier for large items from Fine Art Shippers, you may rest assured that your precious possessions are in safe hands. Our specialists are familiar with handling a wide range of bulky and heavy items, including antique furniture, grand pianos, outdoor sculptures, metal objects of any shape, and large-scale art installations. Plus, we pack and crate all the items in fully-equipped warehouses ourselves to ensure that every transported piece is properly protected in transit, no matter the destination. Besides, Fine Art Shippers is one of the most reliable freight delivery companies in New York City, with offices and partners throughout the globe, meaning that our professional art courier service is not limited to the United States. You can also hire our experienced art courier for large items that need to be safely delivered to anywhere in the world. One more important thing about Fine Art Shippers is that we offer same-day delivery services for art and antiques within the Tri-State Area. Our team can pick up the artwork, properly pack and crate it, and deliver it to the indicated location in the fastest and most cost-effective manner possible. In other words, our art courier for large items is also the right solution for any urgent art moving task. 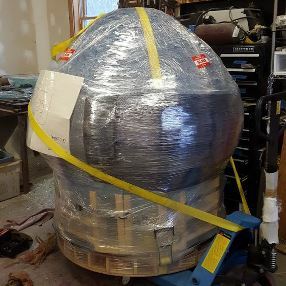 For instance, Fine Art Shippers was entrusted to pack and move a collection of large and heavy glass sculptures by Henry Richardson from the artist’s studio in Lee, MA to New York City for the Architectural Digest Design Show this March. Everything was done professionally and within only one day even despite bad weather conditions. Thereby, whatever your reason to hire an art courier for large items, Fine Art Shippers is always the right place to come for help!